Published on Friday, November 3, 2017. This article appears in the October/November 2017 issue of American Craft Magazine. A spinning steel cage holding artist Justin Ginsberg becomes a cocoon as it’s wrapped with threads of molten glass, in a 2016 performance at the Chrysler Museum Glass Studio. Charlotte Potter earned degrees in glassblowing and performance art, and before starting at the Chrysler Museum of Art, she never imagined she could combine the two in a 9-to-5 job. The idea that somebody like her “would really even find a place in an institution seems pretty ridiculous,” she says. And yet she found a real niche for six years at the Chrysler as glass studio manager and programming director. In fact, she found herself on the leading edge of hot glass as performance, choreographing dramatic monthly events at the museum that have drawn attention nationwide. Alongside her museum job, Potter has a conceptual art practice and a glass jewelry production line; she teaches at schools such as Penland and Oxbow. And recently, the pace of her life ratcheted up another notch – she had a baby. It was all too much, so she’s decided to leave the museum, return home to Vermont, and focus on her daughter and her artwork. Before she started packing, we asked her about the rise of performance glass. Many people know of the B Team troupe of the late 1990s. They might not know Cirque de Verre, the group you performed with in the late 2000s. Today, performers seem to be multiplying in the hot shop. 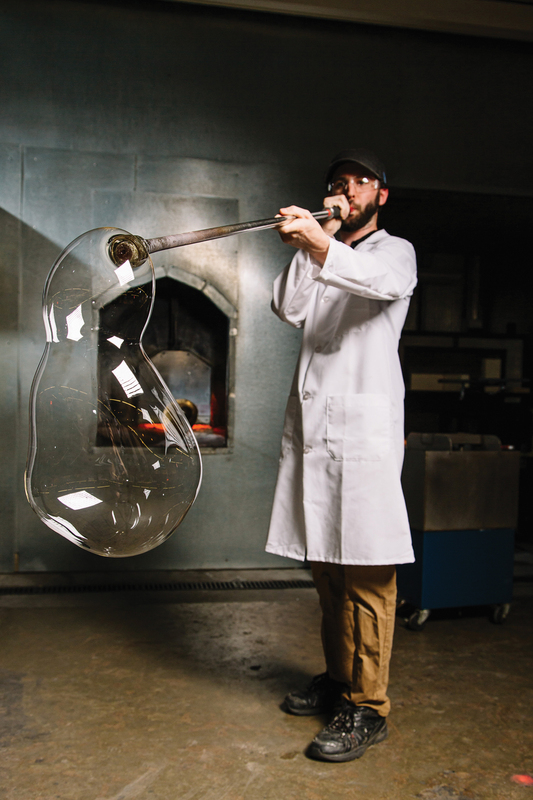 Why does glassblowing lend itself to performance? There is innate drama in the process, and I think that people can sense that. There is always this possibility that someone could get burned [laughs]; there’s an element of danger. Also, if you do it in the evening, it glows, so it has this pulsating, beautiful intensity to it, which I think is alluring. And you have to work in teams to accomplish just about anything. There are a few brilliant people who work solo, but primarily, you work in this tribe of people. Plus, there is more juicy stuff underneath that superficial layer of sexiness; there’s room for conceptual underpinnings and exploration. So glass performance can operate on both levels. The most successful performances probably do operate on both levels. What has your role been as programming director? Have you helped shape the performances of visiting artists? We shape the works, actually, way beforehand. Typically, we schedule a phone call with the artist a couple months out to really talk through what their game plan is and plant some seeds in their brain of “OK, that’s interesting. Have you considered this?” That’s very much a conversation between me, Robin Rogers (the studio assistant manager who’s also the technician and sort of chief of safety), and the artist. By the time that we get to the dress rehearsal, it’s really about brass tacks. We’re usually just refining the content that we’ve all already agreed upon. For instance, if we’re going to attempt to suspend somebody from the ceiling, Peter Pan-style, we make sure that we’ve done that – that we’ve tried it, that everything is being operated properly. We block every single move and make sure that there’s tape on the ground that shows exactly where equipment needs to be – essentially taking all of the cues from theatrical production and applying them to the hot shop as center stage. Tell us a little bit about how the performances happen at the Chrysler. They sell out every single time and usually have a line around the block. Besides low cost, safety, and drama, what is critical to great glass performances? One takeaway from my time in Cirque de Verre was the importance of documentation. Still [photography] and video, but mostly video. One idea that I brought to the Chrysler: If we’re going to do this – commit to performances – it’s imperative that we’re creating an archive of these things so that people can actually see what’s happening. Because you can reach 150 people in person, but we reach 10,000 people visually, online, with the documentation. 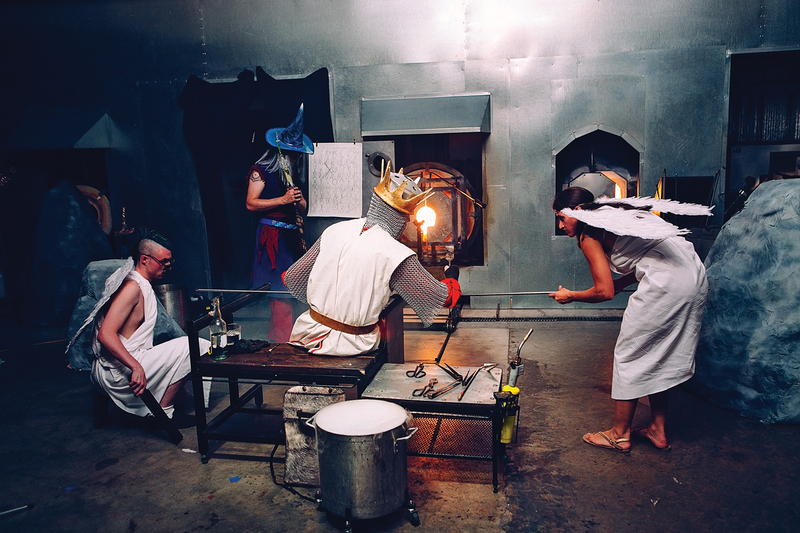 Does this performance mindset influence other activities at the Chrysler’s glass studio? Yes. Even our demonstrations are quite performative. We ask staff members to make something they’ve never made before, something that they don’t feel familiar making. That kind of philosophical shift from end product to, I don’t know, rejoicing in the process, you’ll see throughout the entire thesis of the studio. It’s not just in the performance series. Which performers are you watching now? There are some incredible contemporary groups, such as the Burnt Asphalt Family, the Ancient Truth Investigators, the Butter Eaters. There are a lot of performance troupes currently working. There are a lot of individual artists working in this way, as well, as part of a private studio practice – Jocelyne Prince, Suzanne Peck, Stefanie Pender. Do you see performance becoming more important at other venues? There are a couple of things I can point to that are measurable. 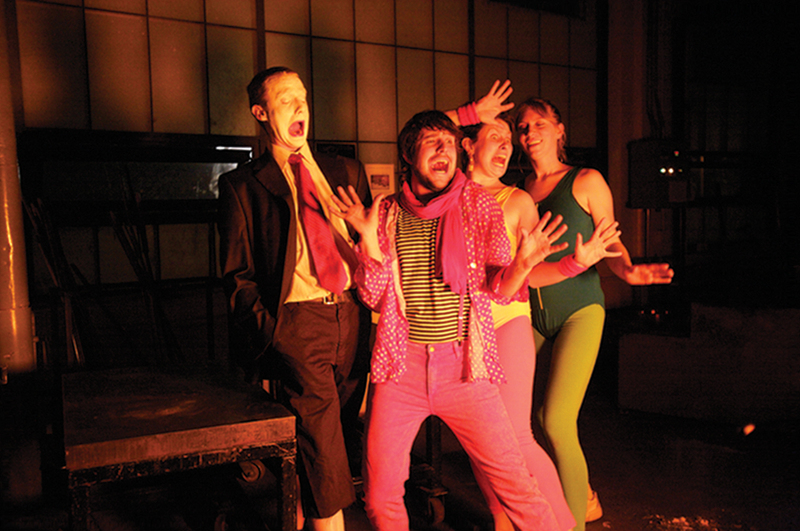 UrbanGlass has recently done an open call for performances. And obviously, they were the incubator for the B Team, so they have a great, rich history of being supportive of this art form. I’ve noticed some more performative acts that come to the 2300° event that happens at Corning [Museum of Glass]. It’s becoming a bit more recognized and accepted institutionally as something that should be supported. I do think our success makes it attractive to other institutions once they recognize that it’s a great way of getting the next generation of people interested in this medium. Do you think that the rise of glass performance reflects a generational trend? You may have heard laments that millennials aren’t as interested in objects as previous generations were. Maybe younger people really are more interested in experiences than in objects? That certainly could be true. But I really hope that there’s still room for the maker in modern society. I am a maker, and that’s really important to me. I do think that, in terms of accessibility, performance is a great gateway drug into glass. People may become interested in this medium and value some of the objects more after seeing how hard it is to make them. Right now, for better or worse, we are living at a time when objects can be cheaply mass-produced. I can’t afford the artwork of my friends. I am guilty of drinking out of CB2 glasses – and I’m the director of a glass studio. So that just says something right there. We’re living in a time when objects are a little bit less coveted and when people, especially millennials, would prefer to have an experience like bungee jumping or skydiving, which often involves taking a picture of yourself that gets posted onto social media and ends up being the takeaway. People actually spend a lot of money for that rewarding photograph. Performance glass is a great example of a way that craft can exist within this society at this time. Online extra: Watch a video of The Descending Pitch from 2015 (also pictured in the image gallery below). 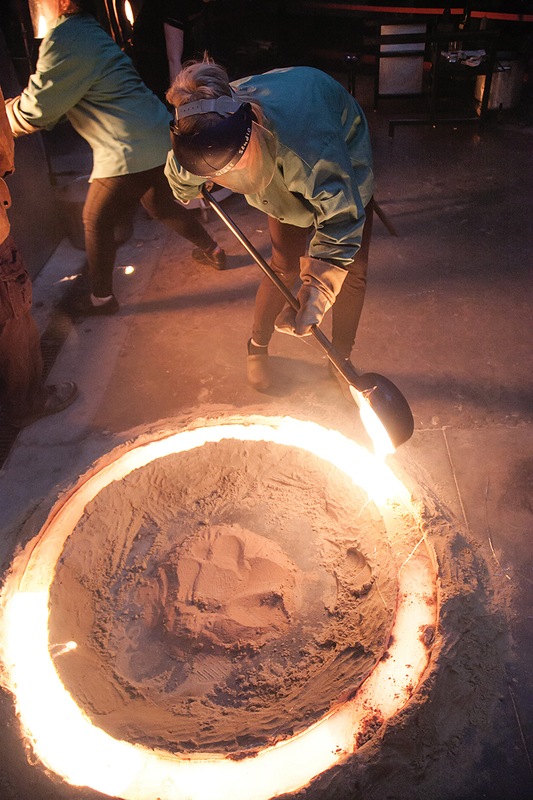 An artist ladles hot glass into a circular sand trough in The Descending Pitch in 2015. Charlotte Potter (second from right) poses with Rhode Island School of Design classmates in 2008 to promote a Cirque de Verre performance at the Corning Museum of Glass. Potter says she learned how to choreograph performances while completing her MFA at RISD. With her are Bryan McGovern Wilson, Chris Wolston, and Kim Harty. In this 2014 performance, Bryan McGovern Wilson as King Arthur tries to create the holy grail in glass – assisted by angels, of course. Tim Spurchise sports a lab coat to give a daily 2016 public demo a scientific vibe. A flair for the dramatic and a preference for process over product infuse every activity at the Chrysler glass studio, says Charlotte Potter, who has been responsible for much of this performance- oriented mindset. She recently left the Chrysler to focus on her family and her studio practice.